And the works the world seems to like best of Schubert’s piano music are certainly his famous IMPROMPTUS & SCHERZI. After an ESCAPADE to the world of Mozart in her 5th recording, Marie-Andrée Ostiguy invites you to rediscover these magnificent jewels of the piano repertoire. The 8 IMPROMPTUS were written in Vienna in 1827, less than one year before Schubert’s death at age 31. In her recordings Montréal Concerto, Tandem, Española, and Valses & Impromptus, pianist Marie-Andrée Ostiguy presented us with romantically inspired works. This recording is no exception. Schubert was the greatest musical poet of all. The melodic spontaneity and clarity of his music appeals equally to the expert and to the layman. The 8 IMPROMPTUS reflect Schubert’s multi-faceted style and his poetic sensibility enabled him to give an entirely new emotional breath to familiar classical formulas. To complete this 73 minute CD, Marie-Andrée Ostiguy also offers us the 2 SCHERZI D 593, two imaginative, light and playful smaller works. 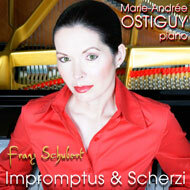 Performed by Marie-Andrée Ostiguy on the Yamaha CFIIIS piano and realized by Henri Brassard, the CD IMPROMPTUS & SCHERZI was recorded in Québec, at the Saint-Hilaire Church, on June 7, 2004.